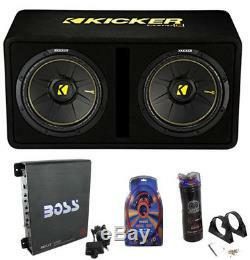 Kicker 44DCWC122 12 1200W Car Subwoofers Sub Enclosure + Amp + Capacitor + Wire. Part Number: 44DCWC122 + R1100M + 4GAMPKIT-SFLEX + BCAP2.2. 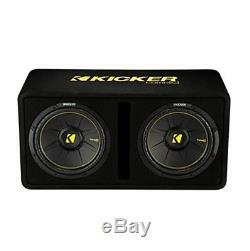 Kicker Dual 12 Inch 1200 watt vented subwoofer enclosure. We are an authorized Kicker dealer. 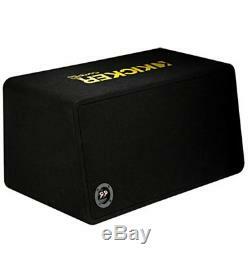 The Kicker 44DCWC122 12 loaded subwoofer enclosure features a MAX power of 1200 watts and a RMS power of 600 watts. Equipped with proven box construction and an impressive bold look, the dual enclosure offer a pair of CompS woofers in a stout MDF box with rounded corners and internal bracing for additional strength and support. All enclosures are covered in plush, charcoal gray carpeting with yellow branding. Slot vents help create ultimate volume. Factory tuned, great value CompS subwoofers and enclosures Ready made KICKER bass that installs in minutes Dual woofer enclosures in 2 Ohm impedance's. The 44DCWC122 Subwoofers are founded on engineering that is tried and true, building upon the success of the KICKER's original Competition Series from 1986. They are equipped with a lightweight, injection molded polypropylene cone and tough, ribbed polyurethane surround for eliminating flex and distortion. Compact to use very little trunk space. Thick black carpet protects the enclosure. Dimensions: 28 x 14 x 13.4375 / 16.375 inches (W x H x Top Depth / Bottom Depth). 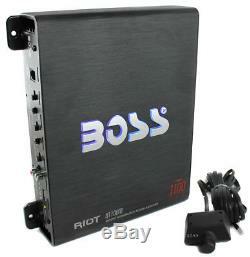 NEW BOSS R1100M 1100W Mono Car Audio Amplifier + BOSS KIT2 8 Gauge Amp Wiring Kit. Signal to Noise Ratio: >102 dB. Dimensions: 10 7/16" (W) x 2 1/4" (H) x 9 1/8 (L). 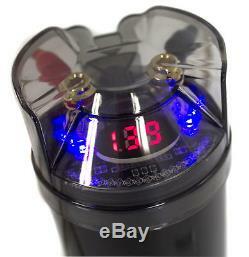 Bullz Audio BCAP 2.2 Farad Digital Power Capacitor! Handles up to 3000 watts of power. Ready for complete amplifier installation. Get your amplifier wired up and ready to go in no-time. Deluxe high quality fuse holder. Gold-plated ANL fuse (100 amps). 17 feet of 4-gauge Super Flex orange power cable. 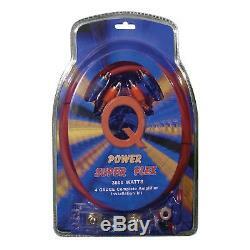 3 feet of 4-gauge Super Flex blue power cable. 17 feet of 18-gauge blue turn-on wire. 25 feet of 16-gauge Super Flex speaker wire. 17 feet of deluxe RCA interconnect. 5/16-inch gold plated ring terminal. 1/4-inch gold plated ring terminal. Number 10 gold-plated ring terminal. Dimensions: 13 x 8 x 3 inches. 44DCWC122 + R1100M + 4GAMPKIT-SFLEX + BCAP2.2. Kicker Performance Audio products are designed and manufactured by Stillwater Designs, headquartered in Stillwater, Oklahoma. As audio continues to evolve, KICKER will continue to be on the industry's cutting edge, pushing the limits of audio design technology, performance, and integration in the quest for ultimate sound. Cancelling Your Order: Your order is important to us and will be processed immediately. Select the reason for the return. This listing is currently undergoing maintenance, we apologise for any inconvenience caused. The item "Kicker 44DCWC122 12 1200W Car Subwoofers Sub Enclosure + Amp + Capacitor + Wire" is in sale since Wednesday, February 7, 2018. This item is in the category "Consumer Electronics\Vehicle Electronics & GPS\Car Audio\Car Subwoofers". The seller is "vminnovations" and is located in Lincoln, Nebraska. This item can be shipped to United States.